on a 22” x 17-1/2” light card stock, we have the story, “H.O. Rawson, Worcester Mass, Dear Sir. Your specimen of lettering copied from my lesson in the Western Penman entitles you to this specimen first prize.” The top 2/3 of the sheet is titles “H.O. 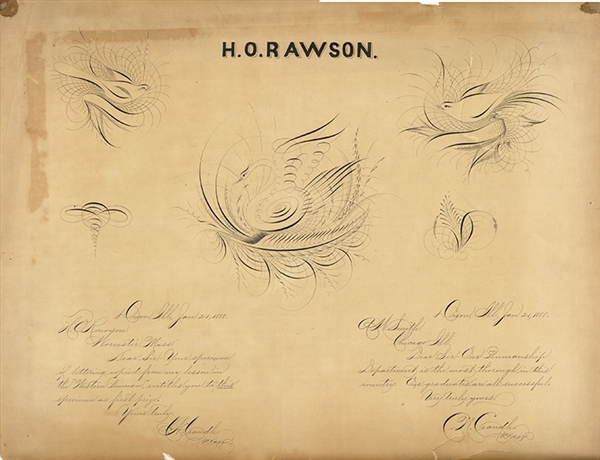 Rawson” followed by beautiful calligraphy birds and a a swan. Very framable, chips at the margins which would mat out, 1888, VG.